Discussion in 'Downhill & Freeride' started by ArthurDH, Dec 30, 2007.
question: do you think the blindside actually allows a (relatively) pedal friendly body position? Are you going to keep the DHR for racing and just use the new bike for training? the 7 point might be an option, but i don't think its geo it's dh-oriented... or is it? 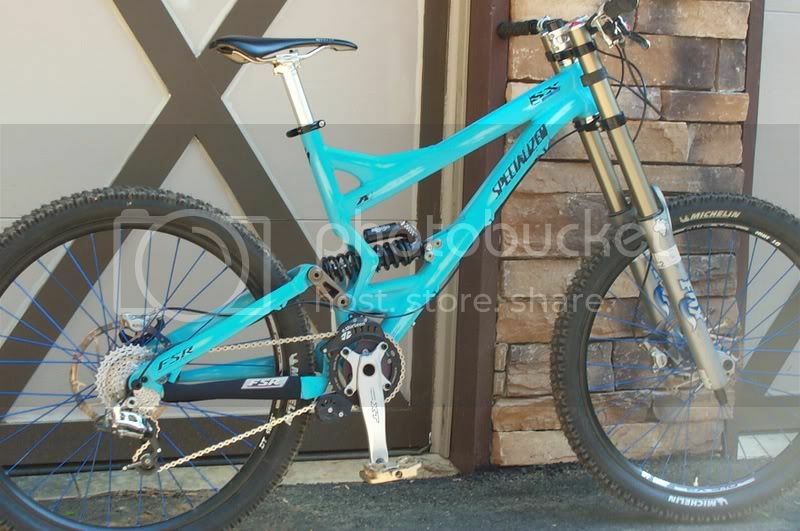 socom would be the perfect pick it's a DH frame that's light and pedable. This one is from a fellow monkey. 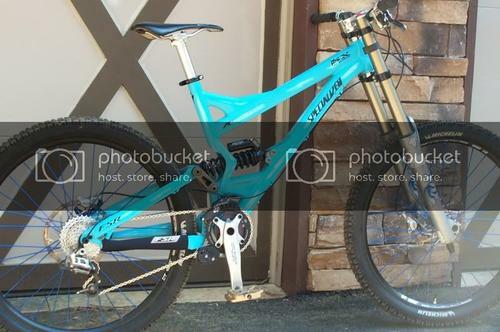 About the sweetest dh rig Ive ever seen. The Blindside can very easily be a pedal-to-the-top bike. 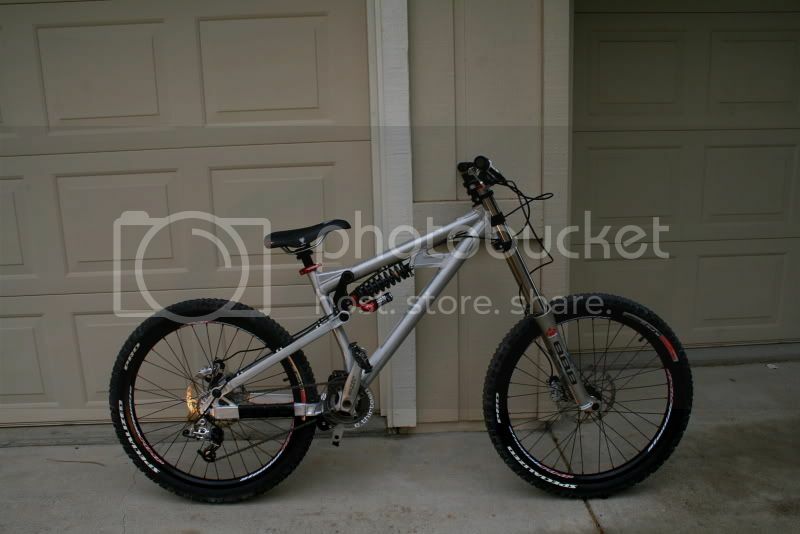 It wont be the most fun, but then again it is an 8" bike. You can put a front derailleur on it if you choose, which will only help the grind to the top. As for geometry, just remember that it is a big travel bike first and climbing wasnt the top priority in the design. Otherwise, I think you should be just fine. Plus you can easily do a sub 40lb build that wont break the bank...and will only help with the climbing. is there anyone who owns a blindside who can tell me if they feel uncomfortable when climbing, or if it forces you to assume an unnatural position even having raised the saddle? I've got a blindside and I can climb with it just fine. Take a look at the turner highline with the shorter shock option for 7 inches of travel. The seat angle is about 74 degrees and the bottom bracket about 14 inches high. Maybe a bit out of your price range but a stellar all around ride for sure. My Blindside climbs fine. Sure it ain't a 5" bike, but I enjoy climbing it more than other larger bikes I've tried. I say go for it! The only thing I had to get used to was the low BB (about 13.7" w/ a flush headset + 888). Other than that, it rocks! A much cheaper option than getting a whole new frame would be to get a telescoping seatpost to use just for your training sessions. I believe Titec makes one called the Pyro' Scoper? blindside is a good option for you, the effective seat tube anlge is steeper than actual. the pivot placement is low so it will pedal fine in the granny ring, get a dhx for the propedal to help also. I used to climb hills with a 38t ring and the seat a little low but then my knees started hurting, now i insist on a granny ring and a straight enough seat tube for full seatpost extension. the blindside could be my next big bike too, unless I can get a deal on a gear-box bike. I just remembered a buddy of mine had the same issues you were having a few years ago, but it was on a Big Hit. He was able to use the telescoping seatpost though. Well new bikes are always GOOD THING! There are a lot of really great frames with steep full length seat tubes that won't hinder your performance at speed and that have a lot lower top tube and center of gravity (read: not ultra low rearward pivot and 17" seat tube). 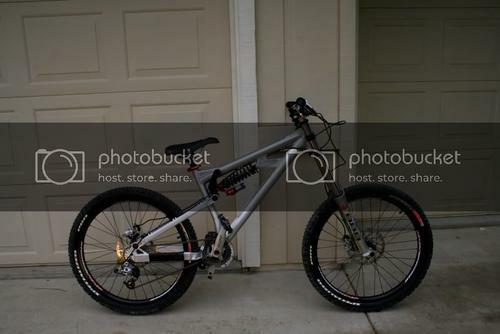 Also for a DH race bike, I'd want to make sure they've got their suspension rate curve figured out. They sure didn't on the Bottlerocket or the GranMal. The Bottlerocket doesn't matter as much in that respect because cornering traction isn't as big of a concern, as well as the fact that most peoples' 5" bikes usually aren't that well tuned anyways. However the Granmal was like riding a bronco. It constantly bucked from the suspension blowing through it's travel on everything. I was running 15% sag (no preload) on mine with 150psi and full bottom resistance, and it still bottomed out off every single lip, roller, anything. It eventually bottomed out on the lip of a highspeed sender and made me overshoot about 30+ ft to flat. Needless to say, I ditched it right after that and never looked back...and never had that problem again! Orange 22 series, Morewood Izumi, Devinci Wilson. Pricier, but far more DH friendly. I used a 27.2 diameter Titec telescopic seatpost for 2 years pedalling a 45lb bike up fireroads carrying my 240lbs with absolutely no problems. Coming to the Blindside from a Nomad, that's one thing that I noticed, the Nomad had terrible chain growth in the low gears cause of the pivot placement, but the Blindside has really no chain growth which is sweet.